Before you say it… this soup was made with a mixture of red and yellow tomatoes. Evan was NOT impressed. He said “Mama, I only like soup made with RED tomatoes.” His loss. Heat olive oil in a heavy soup pot over medium high heat. Add onions and garlic and cook until the onions are translucent. Add the tomatoes and stir for a moment. Add chicken broth and cloves. Bring to a boil. Reduce heat to medium and simmer/boil for 20 minutes. Pour soup into a heat proof bowl (but BE CAREFUL..it’s HOT!). In the soup pot, melt butter over medium heat. Sprinkle flour over the butter. Stir until butter/flour mixture turns golden. Add juice from soup a bit at a time to the mixture while whisking. Continue to add juice until you get a thick smooth paste. Then you can add back all of the soup. Stir well to thicken the soup. Use an immersion (or regular) blender to puree the soup. Stir in milk/cream, salt and pepper to taste. Recipe Notes: I loved this soup but Dewey felt it was too acidic. 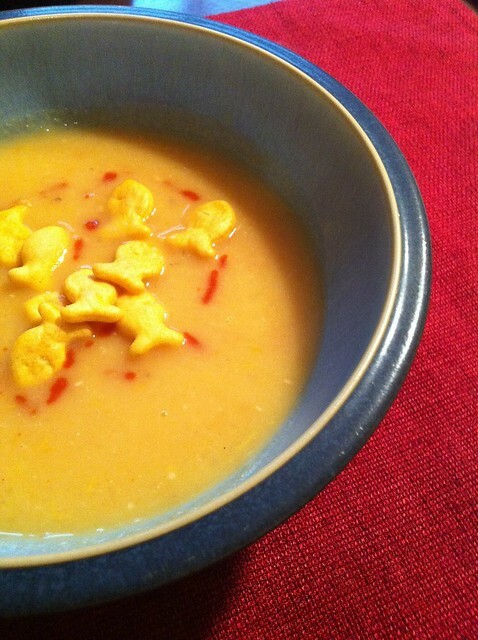 My favorite way to eat it was with a squirt of Sriracha and a handful of goldfish crackers. Mmmm, that looks delish! I think I’m going to try this… but I might try roasting the tomatoes first! I think that would be great. I was in a hurry because it was a work night so I didn’t have time to roast it.